I’ve been getting back into singing since returning to Sydney from London in January. The year before, I was approached by an X-Factor team member when I was singing karaoke, who told me that I should enter the competition, and that I would do really well. I didn’t take him up at the time, but then I thought that the exposure might be good for me as a singer. In February, there was the initial round of auditions for X-Factor. They were held over 3 days, and I went along on the Saturday afternoon. There were reputed to have been about 20,000 people auditioning in the whole country. I’m not sure how many they were looking for, but I can imagine that it was only a small percentage of that. While all that was happening, of course, some people were warming up and practicing, and some even took turns to perform in front of the other competitors. Everyone seemed to be very supportive of everyone else. Me being me, I jumped in and harmonized with some people, which everyone really enjoyed, and people were impressed with me. However, some people left the auditioning area in tears, which didn’t do anything for peoples morale. sang “Breakfast at Tiffanys”, which people love hearing me sing, but I had a sinking feeling as the guy watching me remained completely expressionless as I sang. He asked me to sing something else, so I went into “Be Like That” by 3 Doors Down. He was still expressionless. I asked if I did anything wrong. Keating asked me “Do you not see anything wrong with this?”. I was still confused. He said my song choice was creepy. Mel B said that she couldn’t find anything good to say about it, Guy Sebastian said the song was too intense, Bassingthwaigte said it was entertaining, but that I should stick to my day job. I politely said “OK”. Not making it through didn’t bother me. Being manipulated into looking like a tool; that bothers me. That’s what weighs on me. That’s why I’ve been quiet at work. I can only dread what will happen if that footage actually goes on air. I took off to Dubai for a week to visit a friend and get away from performing. I’ve spoken to some people in the entertainment industry, and we hatched a plan. The week after my X-factor experience, I took up guitar lessons, and after my third one, I wrote ‘Be This Way’, which got onto the radio in Australia the following year! I continued to sing in local venues, and to write songs, which tell other stories from my diary, and therefore my life, and took them to Sean Carey at Trackdown studios, where we recorded them professionally, and they turned out better than I ever could have hoped, and I’m proud to be able to share my EP with the world. Sean is a brilliant producer and a great friend, but the scene here in Australia is small, and not conducive to independent artists. People here love my music, but the logistical support just isn’t here to make it grow. That’s why I’m taking it to the USA. My target date for release stateside is December the 14th. Needless to say, by releasing this CD on my own, without a record label I’m taking serious risk. Getting signed by a major label is a huge undertaking of itself, and even if I were to do so, they would not allow me pursue the artistic direction that would be true to me as an artist. As you have just read: I am all about telling the story. I tell the truth. From the heart. Something that X-Factor and Sony would not know the first thing about. This is a lot of pressure and I could really just use your help. The first week of sales is make or break for a release. Especially without a label. The momentum established in that first week of sales tells the whole industry whether or not the EP has the substance to make people sit up and take notice. People describe my music as a cross between the Chili Pepers and Jack Johnson, and it’s every bit as good. The quality is there. I just need people to notice it. With good numbers, radio, which is already starting to take notice, will give me a bigger platform and higher rotation, meaning, that press and ultimately touring will follow, and my dream is to be a perfomer. That’s my story. That’s what I need to do in order to make this happen. That first week of sales in America needs to go off with a bang. Show the corporations that control the music industry that real people like you care about real artists who make real music and tell a real story. If you’d like to help be a part of this story, you can pre-order the CD today. As a show of appreciation for your early support with this EP, everyone who places an order will get a free copy of Factor This- Initial Recordings, plus the drafts of the songs for my subsequent EP, ‘V-Factor’. The compilation consists of an EP download of 11 actual song demos. You can be part of a select group who own the entire journey from my Garageband recordings in my bedroom, through to the recording studio, and then onto bigger stages. These are the first drafts of my first 11 original songs, in the raw, unproduced form. This has never been offered before and will be the only way to get a copy of these song demos, by pre-ordering original now. 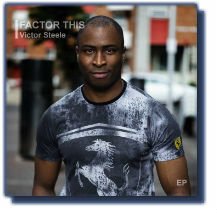 Just place the order now and you’ll be emailed the download link for the Factor This and V-Factor within 48 hours. All pre-orders will be counted towards the first week of USA sales, and you’ll be a part of showing the industry that it’s not all about the manufactured, mass-produced corporate puppets, but rather that it’s the small, authentic and sincere artists who can make it in music. I love that idea… don’t you? Thanks for taking the time to read and support my declaration of independence. And once more, you can pre-order “Factor This” and get your hands on the bonus Original Recordings of Factor This and V-Factor here.